With each of the last five generations, Nintendo has introduced new and innovative features to the world of gaming. While they had failures(Virtual Boy, I’m looking at you), some rocky starts(N64’s odd controller introducing the analog stick and heavy battery packs for the “rumble” sensation we have come to expect from all video game consoles), and some runaway hits- Wii’s motion controls, and the original DS’s integrated touch screen and secondary screen. With this generation of handhelds they introduced stereoscopic 3D that didn’t require glasses, and the option to adjust the intensity(or just plain turn it off). Along with all of these innovations, Nintendo has always ensured a way to endear the public to their new features by programming a game that utilizes these new features in an innovative way. Super Mario 3D Land is that game. While nearly all of Nintendo’s first party games on their highly successful 3DS platform utilize the 3D effect for cool visual tricks and a slight sense of depth to more fully immerse you in the experience, Super Mario 3D Land incorporates the 3D on screen into the very fiber of the game. Every twist and turn, every jump, every fall, and every enemy faced, feels more natural with the 3D on. It is with a huge credit to the developers that they took a 3D environment and made it feel flat when you are not using the 3D slider. Yes, the game can be played without the 3D on, but it takes something away from the experience as a whole. It is a little unfortunate that you need to have the 3D to truly experience this new iteration of Super Mario Land, a franchise discontinued after Wario took it over and claimed it as his own. However, they make up for it by making the perfectly designed levels only a few minutes long each, and breaking up your progress through the levels with an overworld that occasionally gives you power-up minigames a la Super Mario Bros. 3. These minigames not only give you coins, and different power ups to be carried into the next level and used when needed(as is the norm in newer Mario games), but they give your eyes and head a much needed break from all of the amazing 3D your cortex has been hammered with. While it is a great effect, it is a little headache inducing when overdone. When I first played the original DS, the game the made me fall in love with it was New Super Mario Bros. It was a return to the original formula that brought me a lot of joy and reginited my interest in nostalgia and retro gaming. Even after a somewhat stilted run of nearly 300 games, my favorite N64 game remains to be Super Mario 64. Exploring the same level multiple times with new objectives was fun and very innovative at the time, and Super Mario 3D Land integrates the fun and nostalgiac feel of New Super Mario Bros., while bringing the 3D landscape and beautiful level design of Mario 64. 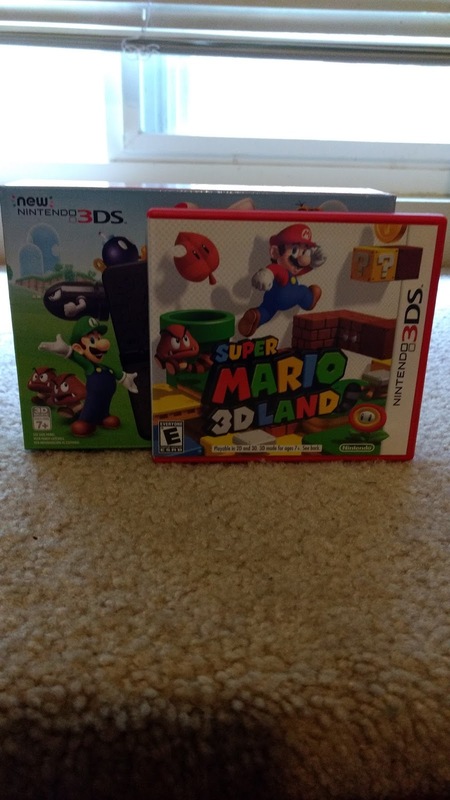 If video games could reproduce, Super Mario 3D Land would be the favorite offspring of these two wondrous games, and we all get to enjoy their beautiful love child. The game is easy at first, with a gradual and expected increase in difficulty that we have come to expect from the venerable series. While it seems to be relatively short(it takes about 15-25 minutes to complete each “world”, and there seem to be the standard 8 worlds), in reality there is much more content than meets the eye. While you do have to collect certain amounts of stars to advance in the game(another feature heavily borrowed from Mario 64), you have to get all of them, with perfect flagpole jumps, and then complete each level with Luigi to experience the entire game. For those of us that aren’t strict completionists, breezing through the main game takes about 4-6 hours, but for everyone else, there is easily 12-20 hours of content to be had, and can be satisfyingly completed in 5-20 minute increments, as is perfect for the handheld, “pick up and play” style that allowed Nintendo dominate the market in the 90’s, and the same formula that keeps them going strong today.